Are you looking for gift ideas for a baby? Why not offer an original, customisable and lifelong gift? Le Petit Pousse offers you its selection of baby gift ideas: birth sets, bébéothèque (baby chest), gift boxes and accessories to keep all your baby's souvenirs safe and avoid forgetting anything about these magical moments. Customise baby’s bebeotheque, bedroom door, bed or wall with the name of your child through these pretty adhesive letters inspired by the schoolchildren handwriting. Type the name of your child in small letters and receive them at home, in a pretty cotton pouch. WHERE TO STORE CHILD MEMORIES? These 3 pretty cotton pouches will protect the most beautiful memories of your child: baby clothes, baptismal dress, first slippers, blanket, pacifier, jewels, medals etc..
To avoid forgetting the magical moments that you will live with baby, take this little notebook in your bag to note everything! 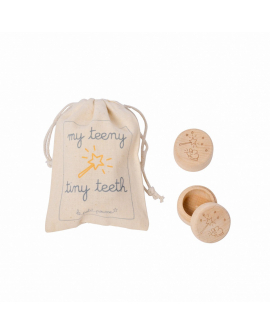 Two adorable wooden tooth boxes, in a nice cotton pouch : an elegant, yet clever and useful present. As both boxes are identical, the Tooth Fairy can prepare a coin or tiny gift beforehand and only has to discreetly swap the boxes underneath the pillow! Hospital bracelet, first bootees, first candle, pair of glasses: put each of these little treasures in a nice organza bag, choose the corresponding sticker and keep it intact in its beautiful souvenir box. A unique album that turns into an easel to highlight a photo. An ideal size to be stored on a shelf or in a bébeéothèque. You enjoy every moment with your baby and want to relive the magic of these moments with your child in a few years? With the Robin bébéothèque (baby chest), offer a magnificent wooden trunk inspired by nature, to gather his most precious childhood memories. And for a unique gift, you can personalise the bébéothèque with your baby’s name! Do you have lots of souvenirs of your daughter that you keep to experience again the magic of childhood with her someday? In the Chloé bébéothèque (baby chest), you can gather all her little things and decorate her room nicely. Enter her name below to order the adhesive letters (delivered in a pouch) that will personalise her bébéothèque. In search of a decorative and original gift idea to offer for a birth or a baby shower? Choose the Côme bébéothèque (baby chest), a trunk for childhood souvenirs that will find its place in the baby’s room as in the living room. To complete this treasure, you can customise the bébéothèque with the child’s name . Want to create a treasure for your daughter with her most beautiful childhood souvenirs? Give her the Capucine bébéothèque (baby chest), a pretty wooden trunk and its clever matching accessories, a birth gift that lasts a lifetime! To complete this treasure, you can customise the bébéothèque (baby chest) with the child’s name! Want to create magical moments with your child by preparing the most beautiful surprise? Offer to baby the Céleste bébéothèque (baby chest), a beautiful wooden chest with boxes and pouches to store all precious souvenirs. And for a unique gift, you can customise the bébéothèque (baby chest) with the child’s name!